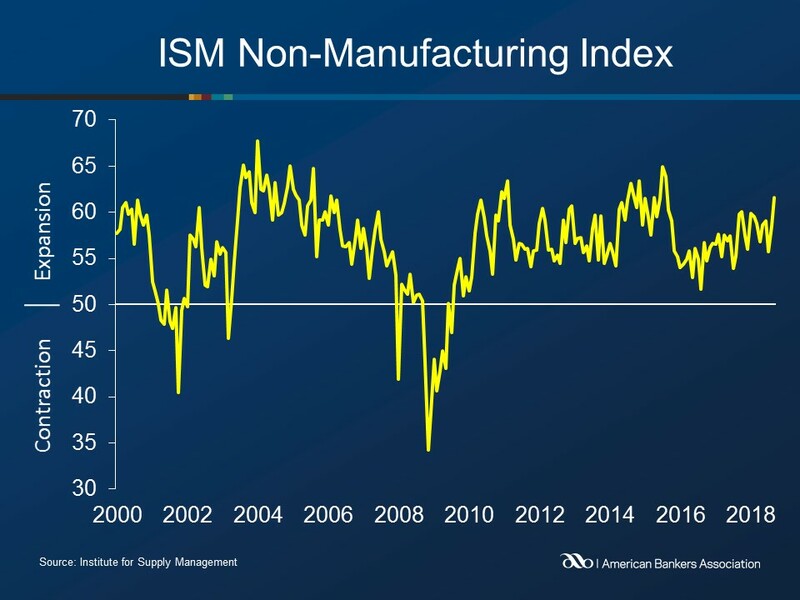 The ISM Non-Manufacturing Index registered 61.6 points in September, 3.1 percentage points above August’s figure. This was the 104th consecutive month of expansion as a reading above 50 indicates growth. Seventeen non-manufacturing industries reported growth, while none reported a decrease. The majority of respondents remain positive about business conditions and the economy, but capacity, logistics, and tariffs are ongoing concerns. Growth in the Business Activity Index increased 4.5 points to 65.2, the 110th consecutive month of growth. Seventeen industries reported increased business activity, while none reported decreased activity. Non-manufacturing employment grew for the 55th consecutive month. The index increased 5.7 points to 62.4. Thirteen industries reported increased employment, while two reported decreased employment. The New Orders Index increased 1.2 points to 61.6. Seventeen industries reported increased business activity, while none reported decreased activity. Supplier deliveries slowed for the 33rd consecutive month, as the index registered 57.0 points (readings above 50 for this index indicate slower deliveries). Twelve industries reported slower deliveries, while one industries reported faster deliveries.